www.gst.gov.in is the Government’s GST website, widely known as the GST Portal/ GSTN portal, which facilitates many kinds of services for taxpayers right from obtaining GST registration, traversing through GST Return filing, application for refunds, and applying for cancellation of GST Registration. The importance of GST regime is tax administration by a strong backing of technology. This means that taxpayers will no longer be required to visit the tax departments in person for assessments and submit applications or returns, although facilitation centres are present across India. The GST website allows all communications to be done on it including responding to applications, rejecting or approving the applications or intimating notices by the department and responding to the same by taxpayers. 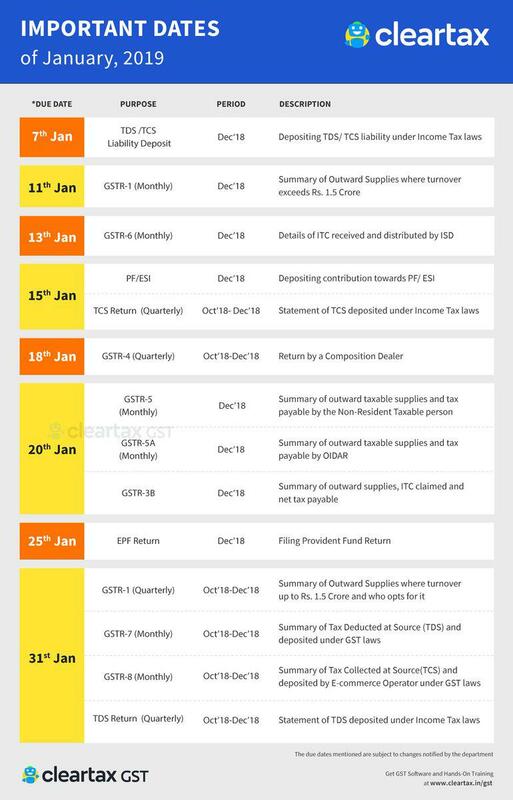 Important changes brought about on the portal with effect from 5th Jan 2019, summary here. A tile ‘TDS/TCS Credit received’ is enabled on the dashboard after logging into the GST portal. Registered taxpayers can now file ‘TDS/TCS credit received’ to avail the credit of the TCS deducted on their GSTIN. Users can file RFD-01A for multiple months in a single window. 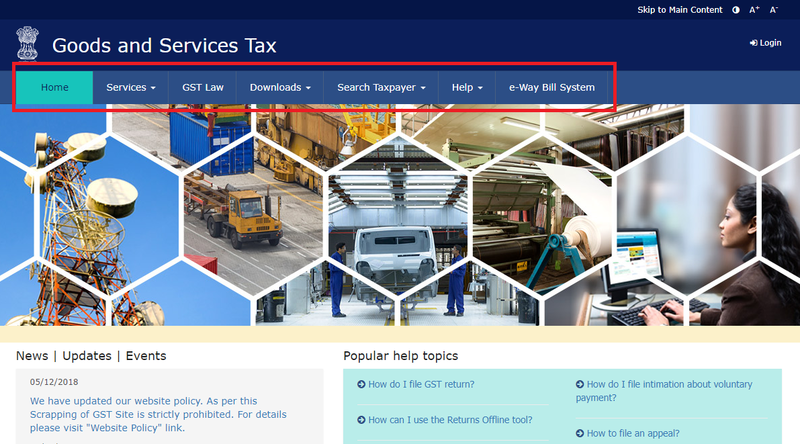 The services section contains GST registration link. A person whose turnover exceeds the threshold-Rs 20 lakhs is required to register under GST. Refer to our article having step by step guide on ‘How to register for GST online’.You can apply for GST Registration online and also ‘Track Application Status’ on the GST portal. The service tab also has other user services like GST Challan Creation, Locate GST Practitioner, Track your Refund Application Status using the ARN number. CGST Act and Rules, SGST Act and Rules and all other acts and rules relevant to GST are available for download on GST Portal. Also, the Latest notifications, amendments & Circulars around GST can be accessed under the GST law tab. You can search taxpayer GSTIN or PAN to verify the details of the taxpayer or GSTINs registered under the PAN. This feature is available on the home page and also after logging in. Also, search for a composition dealer who has Opted In or Opted out of the scheme by entering either the GSTIN or the State from which he is registered. The help section contains many how-to guides, system requirements for various GST processes, User-manuals, Videos and FAQ’s have been made available to the user to resolve any doubt in return filing process, GST registration, etc. The E-way bill system section guides you to the e-way bill portal. 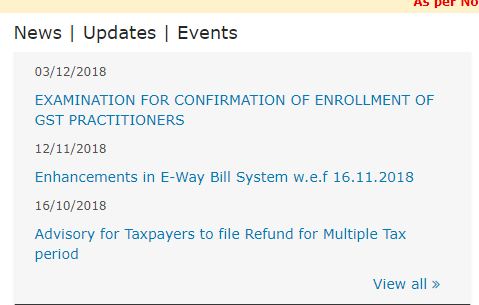 You can also access FAQs, User manual on the e-way bill portal. Dashboard section appears on the screen once you log in to GST portal. You can access your profile, notice(s), order(s) in one click on this dashboard page. Also, the taxpayer can file returns or create tax payment challan from this screen. Apart from the services offered before login, the GST portal provides you with a long list of services once you logging. a. Under the registration tab, you will additionally get : b. Under Ledgers tab, you can access the following : c. Under the returns tab, you can explore the following options : d. Under the payment tab, you will find these : e. After login, you have access to following list of services: f. Lastly, under the refunds tab, you will have the below options to choose: Rest of the tab Like GST law, Search taxpayers, Help section and e-way bill system offers you the same options even after logging to the GST portal. 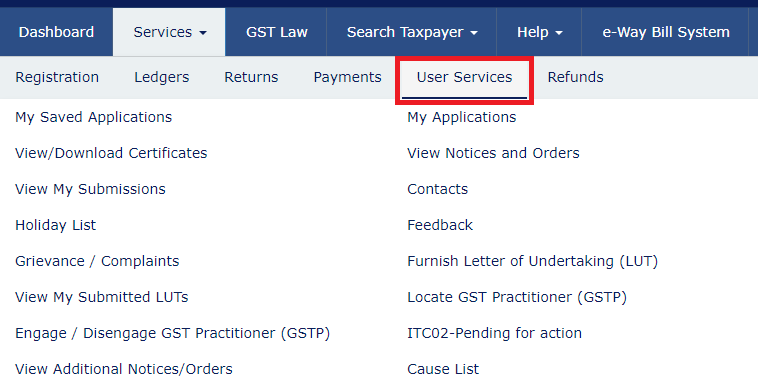 A registered user can log in to www.gst.gov.in Once a user logs in these are the services available to a user. Click on the service to see the detailed guide. Other than the above changing core and non-core fields, browsing notices received, filing ITC Forms, Engage/ Disengage GST Practitioner are some of the other services provided by the GST Portal/ GSTN. 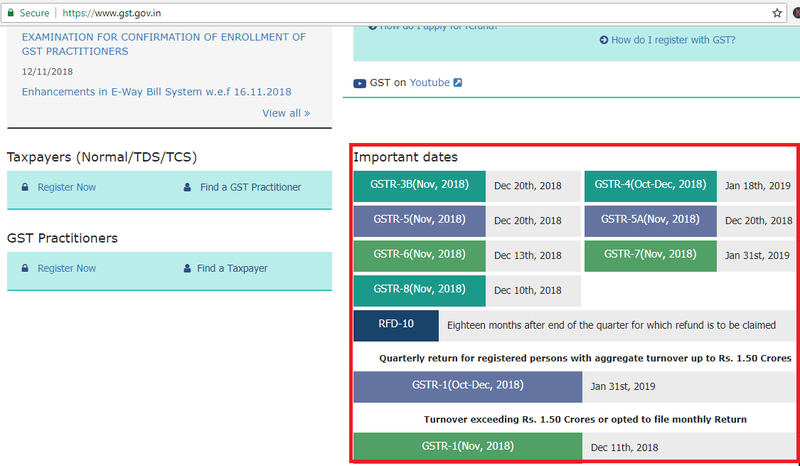 How to register on www.gst.gov.in? Every person is required to register for GST when the turnover exceeds Rs 20 lakh. This is required to be done on GST portal. It is very easy to register on gst.gov.in. It is a simple 11 Step process to register on Government GST portal. 1. ClearTax HSN Code and Rate Finder – Search for GST rate on a product and the HSN or SAC code by just typing in the name of the product in the HSN Code and Rate Finder. 2. 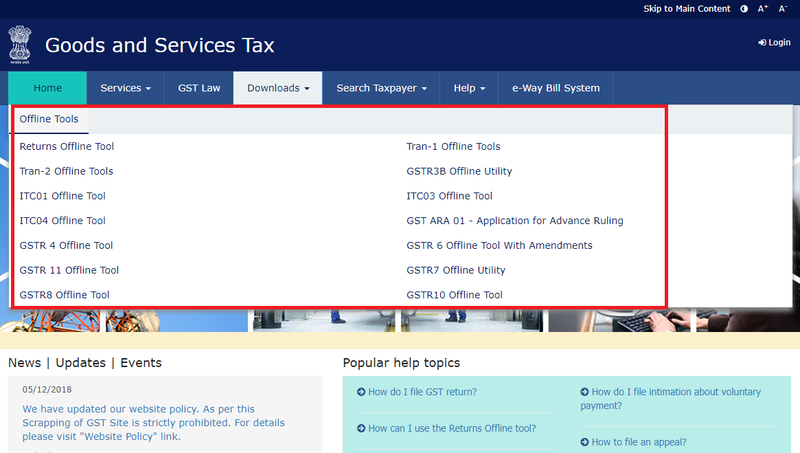 GST Act – Our GST Act page has a search bar. You can search for topics in the act without the need to go through all the pages. 3. ClearTax GST Guide – Search for topics on GST Guide page to understand GST in depth and have good application knowledge of GST. 4. ClearTax GST Software – File GST Returns using ClearTax GST Software. It is quick and easy. 5. ClearTax EWayBill Software – Generate and manage E-Way bills seamlessly using the ClearTax EWayBill Software. Upload the return data directly to your GST login. Know your tax liability before filing your return. Use ClearTax Assistant chrome plugin to autofill tax payment challan. You can now file your GST returns on NIC portal directly through ClearTax eliminating multiple steps.